The Persian Princess is back at SBOW - CHOMP! SLURRP! BURP! I am sure it would have been clear from my last post, I LOVED the Persian Pop Up at SodaBottleOpenerWala. The amazing Anaida Parvenah is back with her super cool Persian Pop Up. This time round, the classics remain with the addition of meal bowls and some stellar desserts. So, hop on for a soulful trip to old Persia with her tasty food and vivacious spirit. In case you haven’t checked my previous post, it’s here. We started with the long standing favourite, Anaida’s Soop-e-Jadooi – coriander chicken, barley, mixed sprouts, turnip, mushrooms, corns, carrots and roasted vermicelli. This soulful soup not only makes foe a full meal, it is super healthy and perfect for winters. Persian Haleem – I couldn’t help but wipe the plate clean when this was served last time. And this, was no different. Slow cooked and and wheat, flavoured with cinnamon and topped with crunchy fried onions. Creamy, rich and served with buttered pav, add a dash of black pepper to savor it best. Chicken Jujeh kebab – succulent chicken kebabs infused with saffron and served with a barley and vegetable salad. The meal bowls – Vegan bowl – spicy vegan kufte with a thick tomato gravy, three mushroom rice, sanboose – mixed veggies in a crisp pastry, sauteed vegetables, barley and cucumber salads, fava beans and potato sticks. Persian chicken bowl – served with chicken in tomato sauce with berries and fava bean rice. The chicken sanbooseh, much like samosa with minced chicken and a buttery, crisp patty. 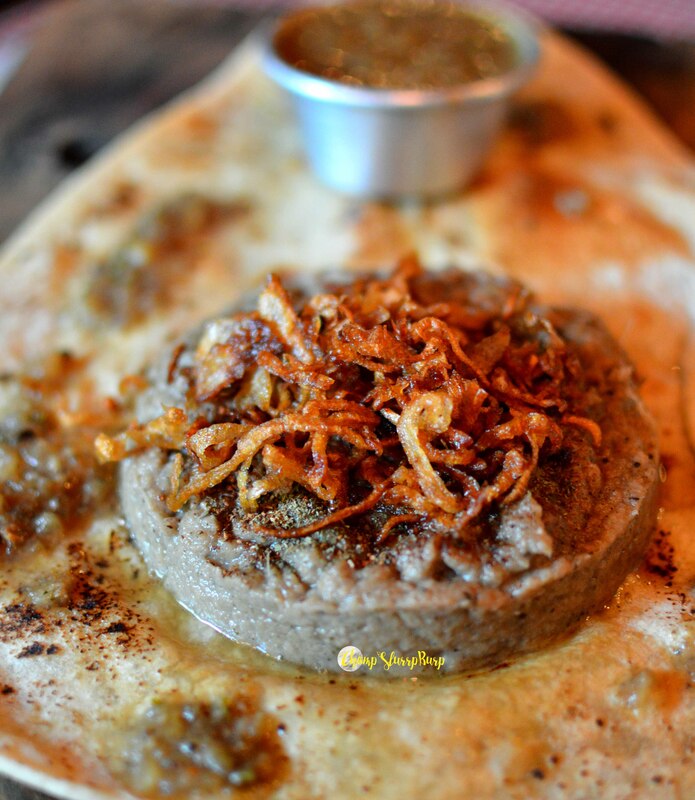 Persian mutton bowl – black lime mutton shank with chickpeas, mutton cutlet and mutton haleem. Fesenjan – chicken cooked with walnut and pomegranate, this sweet and sour chicken with a thick gravy is a little pungent which gives it its uniqueness. Esfahan Beryani – the no rice biryani. Beryani literally means roasted in fire, and the traditional biryani was never made with rice. Esfahan, a famous province in Iran is known for its biryani being mildly minced meat served stop a baked naan. And boy, I can get used to this. Don’t get me wrong, I love biryani, the way we have all grown up eating it, with fragrant rice and whole meat pieces. This smoother version though is made with mutton, cooked overnight and served as a coarse mince. Topped with crunchy onions, this is a must try. Desserts – finish off with Persian Halwa, much like the kada prashad but served rose water and nuts. The Baslog – a coconut and saffron flavored hard shell with ice cream. The Persian Pop up is on till 31st December and you just cannot miss out on the haleem, beryani and Anaida’s super healthy bowl of your choice.